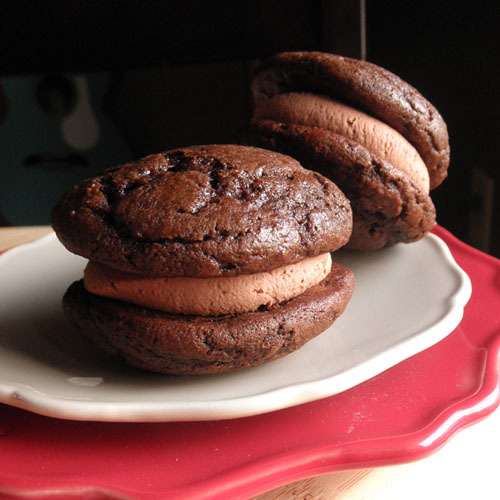 After my last successful adventure with whoopie pies, I decided to try them out with a cocoa mascarpone filling, because I do love chocolate cake with cocoa whipped cream. These came out exactly as I had imagined: soft chocolate cake cookies filled with a very thick and very rich cocoa whipped cream; not too sweet, and very, very chocolatey. Mascarpone Cheese, where have you been all my life? I'm so glad we've finally met. Sift together flour, salt, baking soda, baking powder, and cocoa powder. In a large bowl, cream butter and sugar until light-colored and fluffy. Add egg, buttermilk, and vanilla and beat until combined. Slowly add dry ingredients, mixing until combined. Scoop into an airtight plastic container and refrigerate for 1-2 hours. Using a medium sized cookie scoop (I used the medium Pampered Chef cookie scoop, which is about 2T), drop 2 inches apart onto parchment-lined cookie sheets. Bake at 400 degrees for 8-10 minutes, or until puffed and cracked on top. Allow to cool a couple of minutes on the cookie sheet and then carefully move to a wire rack to finish cooling. Once all cookies are baked and cooled, work on the filling. Cocoa Mascarpone Cream Filling Instructions: In a mixer bowl thoroughly mix cocoa, sugar, and hot water. Allow to cool for about 10-15 minutes. Add cream, mascarpone & vanilla. Mix slowly at first to incorporate ingredients and then beat on high until very thick. Place frosting in a large zip-top bag and cut one of the bottom corners 1/2 inch. Squeeze about 4 tablespoons of frosting on each of 16 cookies. Then top with the remaining 16 cookies. Now you have yummy whoopie pies. Store in an airtight container in the refrigerator, if they last long enough.